An amazingly accurate, vivid, and heart-breaking portrayal of life in Soviet Russia that starts under Stalin’s Reign of Terror and continues into World War II. 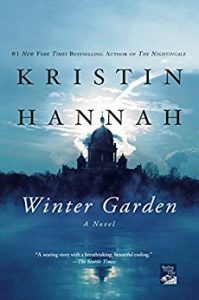 Kristin Hannah writes about the Siege of Leningrad (now St.Petersburg) that lasted for almost two and a half years during World War II. Winter Garden begins in modern day as two sisters, now adults, discover their mother’s traumatic past. Like in her other books, Kristin Hannah focuses on female friendships and family relationships, and many readers enjoy that aspect of her writing. I loved this book because of its historical details, suspenseful plot, and very engaging writing. 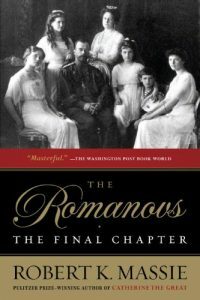 You probably know about the tragic fate of the last Russian tsar and his family, but this book will give you new insights into the private life of the Romanov family. 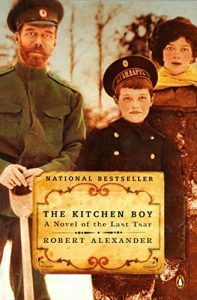 Real letters and notes written by the Romanovs that the author includes in the book make this novel even more fascinating to anyone who is interested in the dramatic and tragic events that followed the October 1917 revolution in Russia. The main reason I liked this book is its sympathetic and realistic portrayal of Nicholas II. By now, everyone has figured out that he was not a good tsar, and he never wanted to be one. Most people are not born leaders, but Nicholas was born a tsar and could not choose his station in life. However, he was a wonderful husband and father, and that’s the side of him that this story focuses on. The fictional ending is hopeful, and I appreciated that. We all need a ray of hope when thinking about such dark times. 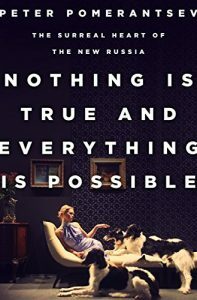 The subtitle of this book is “The Surreal Heart of the new Russia,” and that sums up the tone and focus of this book perfectly. It describes the strangest, the wildest, and the most bizarre aspects of Russia at the beginning of the post-Soviet era. The book perfectly captures the intoxicating atmosphere of a country that suddenly became free after decades of limitations and restrictions. Together with an abundance of new opportunities came the realization that everything Russians knew about the world, economics, and themselves was not true, as most of it was government propaganda. No wonder everyone went a little (or a lot) crazy in these circumstances, and Peter Pomerantsev captures that craziness very well. For me, one of the most poignant moments was a scene in a night club where young women are looking for wealthy men. At first glance, the two groups — the women and the men — seem diametrically opposite, but as the night wears on, they realize that they all came from the same Soviet background, the same food lines, and the same communal flats, and they were no different until the old Soviet reality vanished. This book will not help you understand Russia better (nobody can understand it, not even the Russians themselves) but it will give you a lot of insights presented through entertaining stories. In 2004, three years after the publication of this book, Paul Klebnikov was murdered in Moscow. The three people accused of his murder were acquitted, and the case remains unsolved. 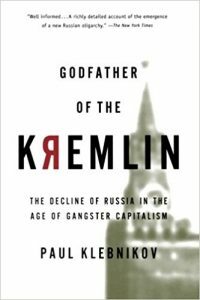 An investigative journalist, Paul Klebnikov analyzes the reasons and the people that contributed to the decline of Russia in the early nineties, focusing on Boris Berezovsky, a mathematician turned businessman and President Yeltsin’s advisor. As a sidenote, in 2013 Berezovsky himself was found dead in his London home. The cause of his death is yet to be determined. Klebnikov’s book reads like a thriller novel, but it’s based on hundreds of documents, interviews, secret tapes, and other materials that make it a unique and valuable historical record. 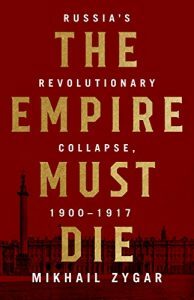 Many books written about the history of Russia at the time of the 1917 revolution tend to highlight the role of Tsar Nicholas in creating conditions that led to the revolution and on the role of Lenin in it. Mikhail Zygar’s book is different: he tells stories of various influential people of the time and the parts they played in the revolution. That approach creates a fuller, more complex, and more fascinating portrait of Russia. I was especially interested in the sections that discussed two prominent Russian writers and the way they shaped public opinion — Leo Tolstoy and Maxim Gorky. The book is filled with other fascinating characters, and let’s not forget the author himself. Besides being a journalist, a writer, and a filmmaker, Mikhail Zygar is the founding editor-in-chief of the only Russian independent news TV-channel, Dozhd. 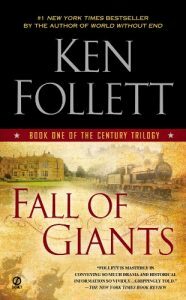 Fall of Giants is the first book of Ken Follett’s Century Trilogy, a project impressive in scope, breadth, and detail. The trilogy follows three generations of five families — American, German, Russian, English, and Welsh — as they experience the most dramatic events of the twentieth century. The first book depicts First World War, the Russian Revolution, and the struggle for women’s suffrage. 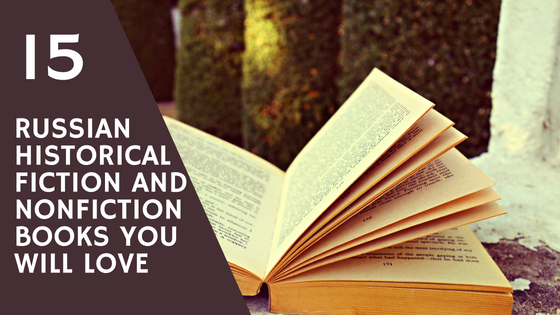 It covers more than Russia, but I included it in my list of Russian historical fiction books because significant parts of all three books take place in Russia. While these books can be read in any order, you’ll enjoy them more if you start with the first, Fall of Giants. I know because I started with book three, and then had to go back and re-read (re-listen, to be specific) all three from the very beginning. Ken Follett can write page-turning plots but he’s also a superb researcher. I appreciated his factual accuracy and his amazing talent at threading together the fates of all these different characters in such an engaging way. The year is 1922, and Count Rostov is sentenced to house arrest in Moscow’s Metropol hotel for writing a poem that the new Bolshevik government did not approve of. As he moves from a larger suite to a small room at the beginning of the story, Count Rostov is forced to make a number of decisions, starting with what objects to take with him, and that first relatively easy decision leads to the beginning of a deeply philosophical and engaging adventure. 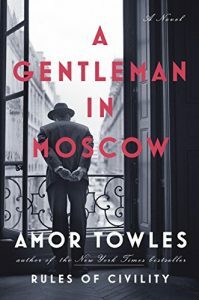 The humor, the wonderful characters, and the beautiful writing style makes this book a unique gem on any Russian historical fiction bookshelf. If you like romance novels, you’ll enjoy this book. The love story between Tatiana and Alexander is compelling, exciting, and made even more powerful by the tragic events around them. I don’t usually read romance novels, but I’m obsessed with Leningrad/St.Petersburg, so the title alone got my attention. It’s a reference to a poem by Alexander Pushkin that he wrote about the monument to Peter the Great in St. Petersburg. 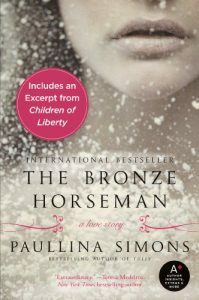 I enjoyed the Russian historical fiction aspects of the book more than the romance. What I loved best about this novel is the perseverance of the human spirit and love through the impossibly difficult times of the siege of Leningrad. Of course, don’t expect it to be all positive: people will do all kinds of things to survive, and the book shows these things quite realistically. This is book is a memoir of an investment banker that reads like a political thriller with intrigue, mystery, suspense, and murder. Bill Browder’s story and his transformation from a financier to a human rights activist is compelling and heart-breaking. It’s also a cautionary tale for anyone trying to do business in a foreign country, especially a country with unstable rules and regulations and a whole different set of business ethics. 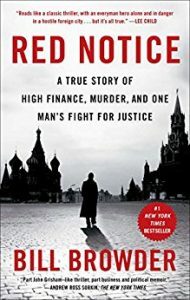 You can question the personality and character of Bill Browder himself and the specific details of his story (and many readers do), but this book is not about him. It’s about corruption and human right abuses in post-Soviet Russia. Vladimir Pozner is a French-born Russian-American journalist, and that alone makes his views interesting. In the Soviet Union, he was best known for the so-called TV-bridges that he hosted with Phil Donahue. TV-bridges were talk shows where Soviet and American studio audiences could interact with each other in a format that seemed almost spontaneous. 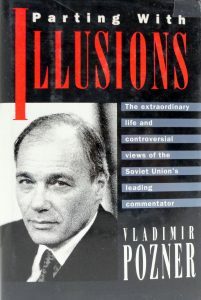 At the time, Pozner’s role was to advocate for the Soviet way of life, and he did it enthusiastically and sincerely. This memoir, published in 1991, discusses his personal life and his changed attitude to socialism and the Soviet way of life. Today, at 84, he’s still active and hosts a weekly interview show on Russian television. 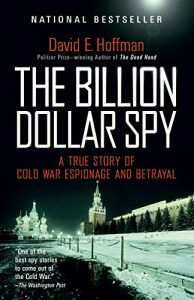 If you like spy stories, thrillers, and are interested in Cold War history, you will enjoy this book. It is a true story of Adolf Tolkachev, a Soviet engineer who became one of the most valuable spies for the United States. From 1975 to 1985, he provided the US with vast amounts of information about Soviet military capabilities. If you have read John Le Carre’s Russia House, you will certainly wonder whether Le Carre based his novel on Tolkachev’s life. I enjoyed this book: it’s interesting, informative and provides a lot of accurate details about life in Russia at the time. And it’s written like a spy novel — which it is. I’ve read a few of Robert K. Massie’s books, and I loved them all. He does a wonderful job portraying people from the past as if they are living, breathing characters of today and as if he knew them personally. 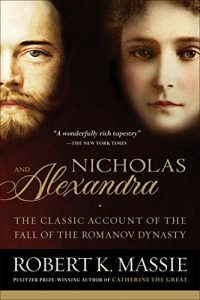 Nicholas and Alexandra reads like a story of one family more than a story of a ruling dynasty, and I enjoyed getting to know the tsar and his wife on a personal level through this book. Some of the more memorable moments of this book for me were their marriage, their son’s hemophilia, the role of Rasputin in their lives and the life of the entire Russia, their religious faith, and, of course, the last days they spent trapped in the House of Special Purpose. Like in his other books, Robert K. Massie manages to masterfully tell a story of a prominent historic figure by describing her personal life. The subtitle is Portrait of a Woman, and it perfectly reflects the content of this book. Robert K. Massie shows Catherine the Great as a person and woman first, and a ruler second. She’s both powerful and vulnerable, and Massie shows her in all her contradictions. 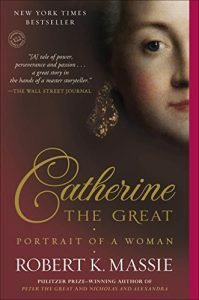 The already compelling and inspiring story of Catherine the Great comes to life with the help of a wonderful storyteller. Russian historical fiction at its best. This book is definitely much more than the story of one man, even if that one man changed the historic course of the whole country. It’s the story of Russia and the West in 17th and 18th centuries. It’s also the story of Russia’s emergence from its isolation and backward ways. And Peter the Great was the man who made that change and progress possible. 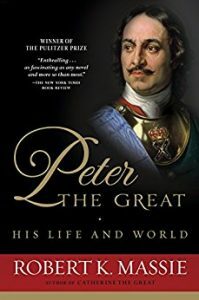 Robert K. Massie shows Peter the Great’s curiosity about Western ways, his travels, his hands-on approach to life, and his desire to improve Russia. At what cost? That’s another question, and Robert K. Massie answers that question in the book as well. A fascinating account of a fascinating time. If you have ever wondered what happened to Grand Duchess Anastasia and whether Anna Anderson was really Anastasia, this book is for you. The book gripped me from the very beginning when Massie tells the story of the last night in the life of Russia’s last tsar and the infamous twenty-three steps that the family took into the basement where they were brutally executed. It’s very well-written, insightful, and detailed. Perhaps even too detailed in some parts, but Massie is a thorough researcher committed to providing all the available information to solve the mystery of Anastasia.